After leaving the Moody Blues in 1966, Birmingham's own "rock 'n' roll gypsy" would have to wait several years before once more attaining the heights of fame and recording success he had at one time dreamed about. Denny Laine's immediate post-Moody Blues career seemed cursed by false-starts and bad luck which in turn wasn't helped by Denny's own somewhat restless nature. "I didn't want to be in that pop star bag. I wanted to do my own thing"
Following his resignation as front-man of The Moody Blues by the end of 1966, Denny Laine signed to Decca's progressive 'Deram' record label as a solo artist. He was still managed by Brian Epstein, thus retaining a strong Beatles connection that would later serve him well. Despite the Moody Blues' having a huge international hit with 'Go Now' in 1964-65, they were unable to follow it up with anything so successful chart-wise. Denny Laine's songwriting partnership with the group's keyboardist Mike Pinder had started to produce promising results but Decca Records wanted more hits along the lines of Go Now. Denny said; "I didn't want to be in that pop star bag. I wanted to do my own thing." Denny Laine's place in the Moody Blues was taken by talented Swindon guitarist/vocalist Justin Hayward but it would still be another year before the band finally found the sustainable success they had strived for (see The Moody Blues). Denny Laine, meanwhile, ensconced himself into the emerging London 'underground' scene in the company of new psychedelic groups like The Soft Machine, The Crazy World Of Arthur Brown, and The Pink Floyd. Denny recalled; "When I wasn't struggling to think up tunes, I hung about the clubs in London, sitting in with various bands and playing occasional solo gigs with my own acoustic guitar backing." A story in Disc magazine reported that Denny Laine had been commissioned to write a score for an Italian film and was to go to Milan and supervise the recording. Unfortunately, this project was later cancelled. In order to do something new or at least different, Denny Laine formed a backing group called "The Electric String Band" consisting of an amplified string quartet. The line-up was cellists Clive Gillinson and Chris Van Campen, with violinists Wilhelm Martin and John Stein - all from the Royal Academy. The group was supplemented by bass guitarist "Binky" McKenzie and drummer Viv Prince (formerly of The Pretty Things). Denny's Electric String Band concept was actually years ahead of what fellow Brummies The Move finally achieved when they evolved into the hugely successful 'Electric Light Orchestra' (or ELO) in the early 1970s. Under direction of Moody Blues and Move producer Denny Cordell, Denny Laine recorded a number of original songs in early 1967. Denny's composition 'Say You Don't Mind' with a string arrangement apparently by future Led Zeppelin member John Paul Jones was chosen for A-side single release and issued in April of that year. A promotional film for it was also made and shown on TV. Say You Don't Mind is probably Denny Laine's best known solo composition and was certainly advanced for its time. Influential radio disc jockey John Peel rated the song highly when he played it on his popular show "Top Gear". Despite critical acclaim, the record didn't sell enough copies to make the charts. The song's commercial appeal was confirmed in 1972 when former Zombies vocalist Colin Blunstone's version was a Top 20 hit. The first "live" performance of Denny Laine's Electric String Band was to take place at London's Saville Theatre on May 3rd 1967, but this was postponed and then cancelled completely when Denny pulled out shortly before the re-scheduled show on May 7th. The reason given was their bass guitarist had left the group a few days before which left insufficient time to rehearse with a replacement. Denny Laine's Electric String Band were reported to have played The Cedar Club in Birmingham supported by 'Robert Plant and The Band Of Joy' on May 10th. The band finally played their London debut at the Tiles Club on May 19th - sharing the bill with Denny's former group The Moody Blues. Because the Royal Academy musicians were still busy doing other things, organizing rehearsals and gigs for the Electric String Band became something of a nightmare. Angus Anderson (violin), and Haflidi Halynisson (cello) were brought in to replace Martin and Van Campen while former 'Georgie Fame and The Blue Flames' member Cliff Barton became the new line-up's bass guitarist. 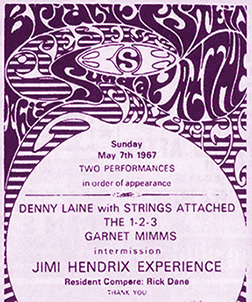 The re-constituted Electric String Band featuring Denny Laine then played their first major gig at the Saville Theatre on June 4th along with 'The Jimi Hendrix Experience' and 'Procol Harum'. Despite the setbacks, Denny Laine's Electric String Band continued to draw critical acclaim whenever they performed at London's hippest venues including The Marquee, The UFO Club, The Roundhouse, and The Middle Earth Club. They even played a date in Birmingham at The Swan Pub in Yardley on June 24 along with fellow Brum rockers The Madding Crowd. In August, Denny Laine's Electric String Band were featured in the Windsor Jazz & Blues Festival (along with Cream, The Pentangle, Jeff Beck and more). They also performed at a three-day rock festival titled "Festival Of The Flower Children" held at Woburn Abbey. "He understood me. He'd back me in anything I wanted to do"
Intending to arrange further bookings, Denny Laine went over to Brian Epstein's house on August 27, 1967 but received no answer when he rang the doorbell. Unknown to Denny, Brian was home but had died from an accidental drug overdose. It was a few months after this tragedy when Denny hooked up with his former Moody Blues manager Tony Secunda. "He understood me. He'd back me in anything I wanted to do." said Denny. Melody Maker magazine reported that a Denny Laine album along with a new single was being prepared in time for Christmas release. Nothing became of this however. Denny Laine's next self-composed single release entitled 'Too Much In Love' came out in January 1968 but despite good reviews it did not gain a chart placing (The Move also covered the song in their live shows). Recording sessions continued for a third single with yet another bass guitarist Andy Leigh. The completed recording of the selected song entitled 'Why Did You Come?' was reportedly rejected by producer Denny Cordell who thought it was "too subtle". Denny Laine and The Electric String Band continued to play gigs as well as being featured on John Peel's radio show. The songs performed and broadcast included such interesting original compositions as 'Catherine's Wheel'; 'Guilty Mind'; the cancelled single 'Why Did You Come?' and a wonderful cover of Tim Hardin's 'Reason To Believe' (later a hit for Rod Stewart). "It was exhausting and expensive" said Denny. "Everyone had to be paid and the bit of money I'd saved up ran out eventually. So there I was again - happy but broke!" The Electric String Band's final gig was in December at the Royal Hotel in London along with Fleetwood Mac. Persistent problems with amplifying the string section in the live shows were never satisfactorily resolved so Denny decided to disband the group when the string players left to go on tour in Russia. Andy Leigh joined Spooky Tooth and Viv Prince went on to work with Jeff Beck. Denny recalled; "I was adrift for a bit. I went to live in Spain and stayed at the house of an American guy so I could study flamenco guitar". Denny Laine initially went to The Canary Islands where he met up with Charlie Jackson, a draft dodger who played flamenco guitar and flute. Denny said; "From there, Charlie and I moved to Spain, to a little town near Seville called Moron de la Frontera. I was particularly influenced by local guitar star Diego del Gastor." 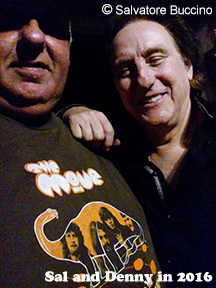 After several months spent busking and living an authentic "gypsy" life-style in Spain, Denny Laine returned to the U.K. where he again hooked up with manager Tony Secunda. It was Secunda's idea to form a Brummie "supergroup" that would include Denny along with Trevor Burton of The Move and Steve Gibbons of The Uglys with the intention of creating an outfit similar in concept to Steve Winwood's highly successful Traffic. Denny had actually played with Steve on an early 'Blind Faith' session but decided not to join them! With Tony Secunda's backing, the new midlands supergroup moved into a rented farm house near Reading in order to write songs and "get it together in the country". Secunda hired Traffic producer Jimmy Miller to record a number of songs by the group which by this time was named "Balls". Unfortunately, the local pub proved too much of an attraction along with the liberal use of 'certain substances' on the farm resulting in not a lot getting done musically or otherwise. Eventually, their cash advance ran-out and the band fell apart with the only record release being a single titled 'Fight For My Country' which turned out to be a catchy "anti-war" anthem composed by Trevor Burton. According to Denny Laine; "Tony Secunda and Jimmy Miller fell out over money and that was the end of that!" (see Balls). Unemployed and adrift again, Denny Laine formed an acoustic trio with Steve Gibbons and Trevor Burton to play a number of college bookings. Help came from legendary 'Cream' and 'Blind Faith' drummer Ginger Baker who invited them to join his new band with Graham Bond called "Air Force". This sprawling group also included Rick Grech along with Traffic's Steve Winwood and Chris Wood but was to suffer from too many line-up changes and general disorganization. Despite the problems, Denny performed with Ginger Baker's Air Force at Birmingham Town Hall in 1969, and at London's Royal Albert Hall in early 1970. 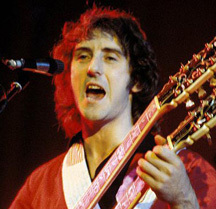 The London show was recorded for a resulting live album from which Denny Laine's rendition of 'Man Of Constant Sorrow' was issued as a single. "Robert Stigwood wanted me and put me on a retainer. A couple of months later, I got a call from Paul"
Ginger Baker's Air Force was to be permanently "grounded" by the end of 1970 when Ginger's heroin addiction got the better of him. Thus, Denny Laine once more found himself adrift and living the gypsy life. Denny's long-time manager Tony Secunda had also found another protege in the form of Marc Bolan, the soon-to-be teenybopper idol fronting the "glam rock" band T-Rex. Denny said; "Robert Stigwood wanted me and put me on a retainer. A couple of months later, I got a call from Paul." Denny Laine had first met Paul McCartney many years previously when Denny Laine and The Diplomats had opened for The Beatles at Ma Regan's West Midlands "Plaza Ballroom" at Old Hill in July 1963. The Moody Blues while managed by Brian Epstein, played support for The Beatles on their British tour in December 1965 and became friends with them. The Beatles later saw some of Denny's "Electric String Band" performances in London with Paul being particularly impressed by the innovative line-up. Denny recalled; "Paul wanted to do a tour after making his 'Ram' album but the session guys he used could make more money elsewhere and only the drummer Denny Seiwell agreed. Paul knew I could sing, write, and play, and so he called me. He asked me to go up to his farm in Scotland." Thus began a highly successful ten year partnership that saw Denny Laine perform as a pivotal member of Paul and Linda's group "Wings" with whom he recorded multi-million selling albums and toured the world playing to packed stadiums of fans. Wings' biggest international hit records included; My Love; Live And Let Die; Jet; Band On The Run; Listen To What The Man Said; Silly Love Songs; Let 'Em In; and With A Little Luck. The Wings line-up was to change a few times during the 1970s but Paul and Linda McCartney along with Denny Laine remained as the core of the group. As well as playing guitar and singing backup with some lead vocals on Wings records, Denny would also substitute on bass guitar when Paul switched over to piano or guitar on-stage. In 1977, Denny co-wrote with Paul McCartney the song 'Mull Of Kintyre' which became one of the biggest selling British singles of all time. Denny Laine finally found the commercial success he had not experienced since Go Now. Wings stopped touring after John Lennon was murdered in 1980 and they disbanded the following year. It had been reported that Denny Laine had a "falling-out" with Paul McCartney after a much-publicized visit to Japan on which Paul was arrested for marijuana possession. According to Denny Laine though; "There was no 'falling-out'. We just sort of drifted apart. I'd made a new solo album and was tired of being in the recording studio. I wanted to go out and play in front of an audience again." Since then, Denny has continued to record albums of his own and make guest appearances on recordings and on-stage with other famous rock musicians. He has also made personal appearances at various large music events and Beatles conventions. In recent times, Denny Laine and Paul McCartney have met up on a friendly basis so may yet collaborate again. Denny has even mentioned meeting with his old band-mate Mike Pinder of The Moody Blues to discuss a possible new recording project. As of 2012, Denny Laine was writing his autobiography which when published I'm sure will be of interest to many. For all the latest information about Denny Laine including tour dates and record releases, visit his official web site and FaceBook page links as shown below. Many thanks to rock music journalist Nick Warburton for sending much of the information shown on this web page (see www.nickwarburton.com). Additional info. from 'The Denny Laine Songbook' and Alan Clayson from Record Collector, July 1995.